There is no other way to say it: growing gooseberries is a pain. The bushes with their long thorns are outright dangerous. Wearing sturdy gloves when picking the small berries is not really an option so harvesting them often leaves me with deep scratches on my hands and lower arms. My husband still has a few scars on his calves from the time when he moved a row of raspberries nearby and the gooseberry thorns pierced through his jeans. Also, removing the minuscule blossom ends and stems takes forever but it has to be done, otherwise the pie, compote or whatever you make tastes grainy. Wouldn’t you know it that of my three gooseberry bushes, the cultivar with the largest berries and the easiest to pick, Invicta, yielded exactly four (4) gooseberries this year. Meanwhile the other two cultivars, Hinnonmaki Red and Pixwell, are filled with tiny berries. They are tastier than the hairy Invictas so that’s at least one trade-off for being more labor-intensive. 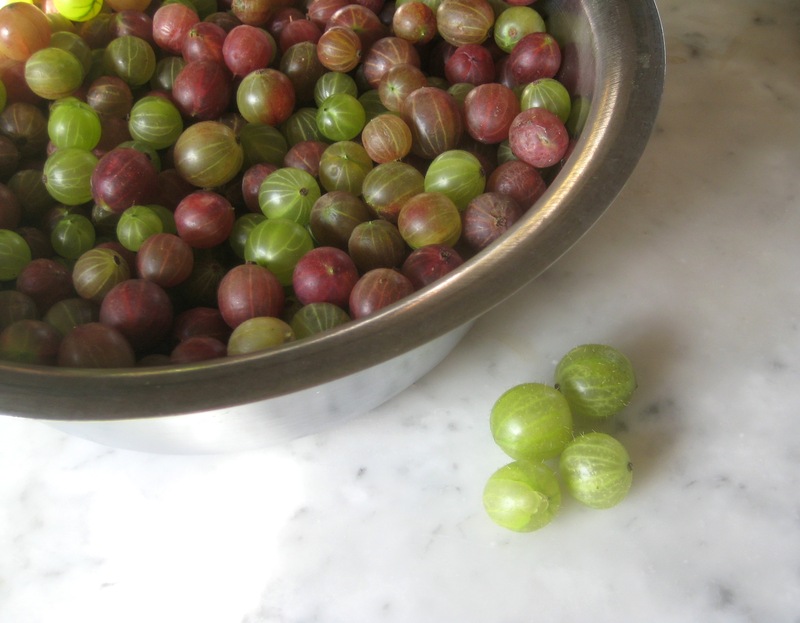 Initially I was leaning towards tossing the entire 3½ pounds of gooseberries without any tedious preparation into the steam juicer to make gooseberry jelly. But then my culinary curiosity took over and I wanted to try something new, special, and hopefully delicious. 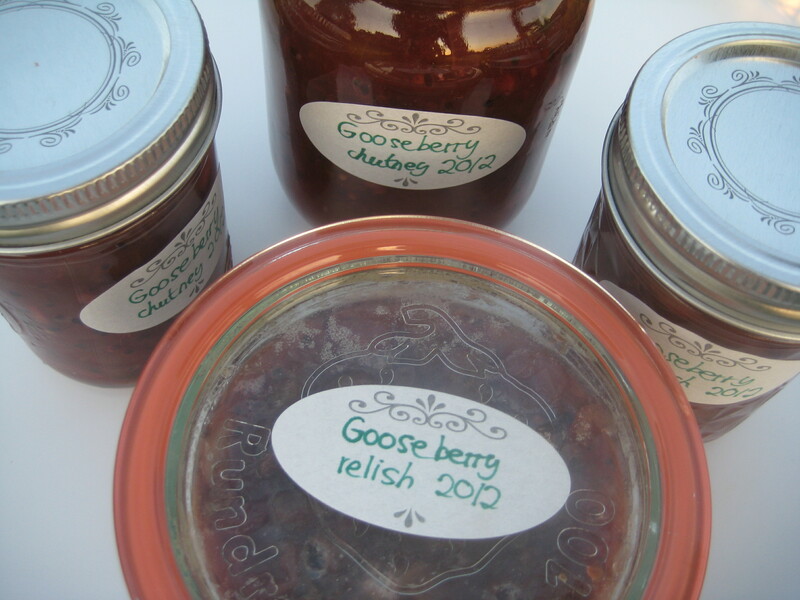 I have always wanted to make gooseberry chutney. When I saw that the recipe for Gooseberry Relish by food writer Edward Schneider in the The New York Times is made with only five ingredients, including elderflower cordial, I had found my inspiration. What a perfect reason to pop open the first bottle of my elderflower syrup! For a moment I was slightly concerned about the relish being suitable for canning, as the recipe does not mention this option. After all, I want us to savor the relish in the winter and not now, in the midst of fruit cornucopia. But after consulting with my dietitian friend, I was reassured that the gooseberries contain enough acidity to make canning safe. The other recipe I tried was Gooseberry Chutney, to which I added elderflower vinegar. I have barely started to harvest from the third gooseberry bush. Soon I will be out there again picking, wincing each time I hit a thorn. But the fact that I can just walk into the garden, while other people hungry for gooseberries hunt them down at farmers’ markets, makes me appreciate more what I have. Also, with the taste of that delicious gooseberry relish and chutney still lingering on my tongue, I know again what I’m doing this for. 1. Peel the ginger, cut it in half lengthwise and slice it thinly. Tie it into a piece of cheesecloth, together with the mustard seeds, and secure the bag with butcher twine. 2. Place the bag in a heavy saucepan with the gooseberries, the sugar and the elderflower syrup. Stir to mix and slowly bring to a boil, then reduce the heat and simmer uncovered for about 1 hour, until the relish thickens. Stir every now and then, more often as it thickens, to prevent the relish from sticking to the bottom of the pan. Towards the end, check for sweetness and add brown sugar to taste. 3. Discard the ginger bag. Fill the piping hot relish in sterilized jars placed on a damp kitchen towel. Wipe the rims of the jars with a damp piece of paper towel to remove any drips. Place the lids and the bands on the jars and process in a boiling water bath for 10 minutes. 4. Let cool and set for 24 hours without moving the jars. 1. Put all the ingredients in a heavy saucepan. Stir to mix and slowly bring to a boil, then reduce the heat and simmer uncovered for 45 minutes to 1 hour, until the chutney thickens. Stir every now and then, especially towards the end, so it won’t scorch. 2. Process in boiling water batch as described in the Gooseberry Relish recipe above. Gosh, that’s sound delicious! I always liked gooseberries even though I had to pick them when I was a child. We had the “normal” green ones and the adorable red ones. My mother made mainly jam out, sometimes cake, but never exotic dishes like “gooseberry fool”, a “pavlova” or your relish.. great! luv gooseberries! got some in my fridge right now with a plan to serve them on top of a pavlova. exciting!